Hangouts Chat faces competition from Microsoft Teams, which also allows users to chat, share and collaborate with team members over docs, sheets and slides in real time. Google has integrated its chat-based collaboration solution Hangouts Chat into G Suite, making it available to all. Until now it was only available under beta to a few companies. Like most collaboration apps such as Microsoft Teams and Slack, Hangouts Chat allows users to discuss projects and office work more efficiently with individuals or groups. It also allows users to track progress through threaded chats. It supports 28 languages and can accommodate up to 8,000 users in a single chat room. Users can join a chat from anywhere with a smartphone, tablet or PC. The app works on all major platforms such as Android, iOS, Windows 10 and Mac OS. The unique selling point of the Hangouts Chat is its integration with other G Suite apps. Its users can access and share docs, sheets or slides from Google Drive with team members and then suggest or make changes in real time. Similarly, users can check and join video meetings on Hangouts Meet. Group administrators get more controls and options than other participants. They can search, archive and export chat-specific data to encrypted vaults. To make the app more assistive and speed up workflow in nature, Google has added chat bots. The Google Drive bot will notify users when a file is shared with them or when a team member comments on one of the shared files. Similarly, the Meet bot can schedule a meeting using Calendar app when users want. Hangouts Chat also supports Single Sign-On (SSO), which means users can log into it along with a number of other G Suite apps with a single signing process. To prevent anyone from hacking into users’ chat account, Google provides two-step verification with a Security key. So after typing in the password, users will have to plug in a USB-based dongle called Security key and type the pin number. A USB-based security key costs starts at Rs3,000. To access Hangouts Chat, users need to have a G Suite subscription which starts at $5 per month and offers 30GB cloud storage with it. 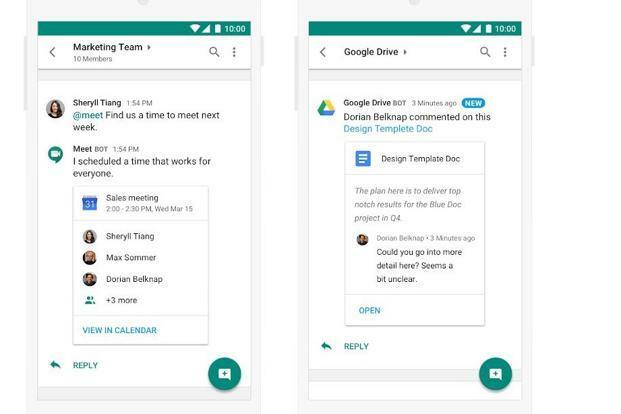 Hangouts Chat faces competition from Microsoft Teams, which also allows users to chat, share and collaborate with team members over docs, sheets and slides in real time. It is also integrated with Microsoft’s Office 365 suite which starts at Rs360 a month. Teams also allow users to link third-party services such as Twitter and GitHub and get notification and updates from them. What gives Teams an edge over Hangouts Chat is the fact that most enterprise users are already familiar with these tools.